SANTIAGO, Mar 9 2009 (IPS) - In 2008, Chile’s state coffers took in just over one billion dollars from the specific tax on fuels. But at the same time, the government injected 700 million dollars into a fund that year to shore up fuel prices and made another 500 million available in case the price of oil continued to rise. 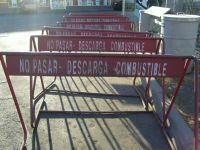 "Stay out – refueling" reads a barrier at a gas station in Santiago. Credit: Daniela Estrada/IPS. This is one of the contradictions pointed out by economists and industry sources who spoke to IPS about the question of fuel subsidies and taxes. The fuel tax, levied since 1986, and the Fuel Price Stabilisation Fund (FEPCO), created in 2005, drew public attention last year because of the soaring oil prices, which hit a record high of 147 dollars a barrel in July. Under pressure from the transport industry and drivers in this oil importing country, the government decided to lower the tax and strengthen the FEPCO fund with part of the state’s savings based on windfall earnings from copper exports. In 2008, the specific fuel tax brought in 1.07 billion dollars, 27.5 percent less than the 2007 total of 1.36 billion dollars, and equivalent to 5.2 percent of all taxes and to one percent of GDP. Although both the tax and the fund drew criticism, the issue seemed to fade into the background in the wake of the collapse of fuel prices and the outbreak of the global economic crisis. But in January, when the government presented its national action plan against climate change, environmentalists raised their voices to complain about what they saw as "doublespeak". By lowering the tax and channeling funds into FEPCO, President Michelle Bachelet "literally facilitated the burning of fossil fuels," Luis Mariano Rendón, spokesman for the Alliance for Climatic Justice, a local NGO, told IPS. Chile’s greenhouse gas emissions have increased, on top of the fact that Santiago is one of the most polluted cities in the world, with vehicles responsible for 48 percent of the smog. More than 6,000 deaths a year are attributed to air pollution in Chile, according to figures from 2004. The tax on fuels "can be seen as a mechanism for raising funds, for taxing the use of roads, or as an environmental tax. Without expressing a judgment as to which is the best alternative, today we can see that it is poorly designed to fulfill any of these objectives," economist Sebastián Ainzúa, with the environmental group Fundación Terram, told IPS. The tax on imports or sales of diesel fuel and gasoline was established in 1986 to help rebuild roads destroyed by the 1985 earthquake. But once that goal was fulfilled, the tax continued to be collected, even though the state later held public tenders and awarded the contracts for the construction of highways to private companies, which charge tolls to maintain them. In addition, vehicle owners pay a circulation permit each year. In Chile, all taxes go into the general budget and funds are later allocated to the areas of health, education, social security, etc. The head of the Association of Fuel Distributors, Sydney Houston, complains that the tax only applies to drivers and users of the country’s roads, and not to other large oil consumers, like mining companies, shipping firms and power plants. In 2008, taxes on gasoline – brought in by the specific fuel tax plus the value added tax – represented just under 42 percent of the final price of fuel, according to the Economic Commission for Latin America (ECLAC). The cost of refining accounted for just over 52 percent, while the remaining six percent represented distribution and marketing. For diesel fuel, taxes accounted for 24.1 percent of the final price, refining 69.4 percent and distribution and marketing 6.5 percent. Since the fuel tax was created, it has undergone modifications in response to pressure, mainly from truckers, who held a several day long strike last year. While the tax on diesel fuel has remained steady at 1.5 monthly "Unidades Tributarias Mensuales" (UTM – Monthly Tax Unit – currently set at roughly 60 dollars) per cubic metre for cars, the cargo transport association obtained a 25 percent reduction for trucks in 2001, and a year-long 80 percent reduction in June 2008. At this time, truckers are paying 0.3 UTMs per cubic metre of diesel. The tax on gasoline, meanwhile, went up from two UTMs per cubic metre in 1986 to six UTMs in December 2001. In March 2008, a decision was taken to make the tax more flexible for two years, lowering it to 4.5 UTMs per cubic metre if the average price of oil for the previous 12 months was above 75 dollars a barrel. On the other hand, if the price of oil dropped below an average of 65 dollars, the tax would once again go up to six UTMs. And in August, another variable was introduced: if the price averaged more than 85 dollars a barrel, the tax would be cut to 3.5 UTMs per cubic metre. What is disturbing, said Ainzúa and Ana Luisa Covarrubias, of Freedom and Development, a think tank linked to the rightwing opposition alliance, is that the tax is lower for diesel fuel – more polluting than gasoline – which is used mainly by buses and trucks, despite the fact that they take a heavier toll on roads than cars. In addition, the lower tax on diesel has encouraged imports of diesel-fueled cars, casting into doubt any supposed environmental objective of the tax, they said. Since demand for fuel did not significantly drop despite last year’s soaring prices, some experts recommend that with respect to rates and fees for circulation permits, newer cars should pay less than older ones – the opposite of the present system – to help reduce pollution, traffic jams and accidents. Meanwhile, to keep down the prices of gasoline, cooking oil and household kerosene – which have been driven up by the fuel tax – FEPCO provides subsidies to consumers in the form of credits when oil is higher than a set price band and collects taxes when it drops below the band. The system was to have guaranteed the fund’s self-sufficiency, but "FEPCO has in general given out subsidies more than it has collected taxes," said Covarrubias. The fund was initially set up in 2005 with 10 million dollars, for the period up to Jun. 30, 2006, at which point it was extended to Jun. 20, 2007, when it received another 60 million dollars and a law was passed to keep it in effect until 2010. In January 2008, 200 million dollars went into the fund, and in June another one billion dollars was approved, although only 500 million dollars have so far been transferred. The other half will be available if oil prices go up, although for now an additional transfer is unlikely because as of December the fund still held 430 million dollars. That means that in just one year, the government authorised the transfer of 1.2 billion dollars to FEPCO, two-thirds more than what was earmarked for the promotion of non-conventional renewable energy sources – and 32 times more than what is to go into the construction of 690 kilometres of bike paths in the capital. "Does it make sense to subsidise a resource like oil, which is just going to get more and more expensive?" asked Ainzúa. The government defends its support for FEPCO by pointing out that it enabled it to lower the price of fuel, especially gasoline and cooking gas, two of the products that have the heaviest influence on the cost of living. But ECLAC and other institutions have recommended against across-the-board subsidies, saying they should instead target the poor, like cash transfers. FEPCO benefits medium and low income sectors that use domestic liquefied gas and kerosene, as well as the better-off, who are the big consumers of gasoline. Two municipalities in Santiago illustrate the gap in the use of the automobile: while there are 81,886 privately owned cars in wealthy Vitacura, home to 84,903 people, there are just 7,329 cars in the low-income district of La Granja, population 143,673, according to the National Statistics Institute. Another aspect of the debate is transparency, for example with regard to the functioning of the Empresa Nacional del Petróleo (ENAP), which refines and sells more than 80 percent of all fuel sold in Chile. Last year, the National Economic Prosecutor’s office launched an inquiry into alleged collusion on prices among fuel distributors, due to price rises that went beyond the reference prices set weekly by ENAP, as well as delays in implementing price reductions when necessary. In Houston’s view, "officials tend to forget that this is a free, competitive and deregulated market." The head of the Association of Fuel Distributors argues that the best way to make the industry transparent would be a debate on a hydrocarbons law. In January, the lower house of Congress approved the makeup of a committee established to investigate the huge losses that ENAP reported in 2008, supposedly the result of importing oil at a higher price than what fuel was fetching on the domestic market, as the global price of oil plunged. In June 2008, the government had earmarked 250 million dollars from the state coffers to shore up the state-run oil refinery. Today opinions are divided. Some propose eliminating both the fuel tax and FEPCO, so that prices will be free of distortions, and later provide subsidies to the poorest consumers. Others argue that the tax should be modified so the state will continue to pull in funds and so it will not backtrack on environmental questions. A source at the Finance Ministry told IPS that the government has asked the Inter-American Development Bank (IDB) for a study comparing the current value of the fuel tax "with the one it should have, if the key external factors associated with road transportation were taken into account." But the debate on the fuel tax and FEPCO will almost certainly be postponed, say analysts, because the next year will see a volatile mixture: the global economic crisis and the December presidential and parliamentary elections.